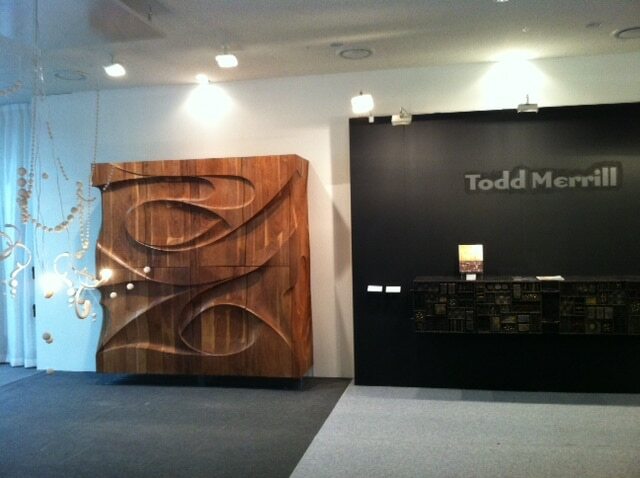 April 1, 2012 New York, NY—Todd Merrill is honored to be exhibiting for the first time at GallerySeoul 12 in Seoul, Korea, April 20 – 23 2012. Merrill will show the best of his Studio Contemporary artists’ work alongside 20th Century design masterworks. Merrill introduced Studio Contemporary in 2009 and has since worked tirelessly to promote the best international craftsmen working today. Merrill’s booth will feature the creations of Beth Katleman, Michael Coffey, Joseph Walsh, and Jennifer Trask. In keeping with the tradition of American studio arts Todd Merrill will show vintage masterworks by metal sculptor Paul Evans and sculptural work by Vasa, as well as a massive tapestry by Jan Yoors. “Folly” (2010) a 16 foot-long porcelain sculpture by Beth Katleman has been praised by critics world-wide following successful exhibitions last year in Paris, Basel, London, and New York. 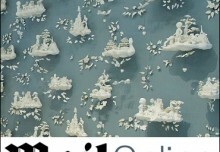 “Folly” is a three-dimensional ceramic rendering of traditional Toile de Jouy fabric or wallpaper. On close inspection, the elegant Chinoiserie-inspired pavilions that comprise the landscape of “Folly” are populated with kitschy figures from popular culture that tell a dark and poetic fairy tale. The exuberance and refinement of “Folly” are astonishing to behold as it simultaneously blurs the lines between art, design, and craft. 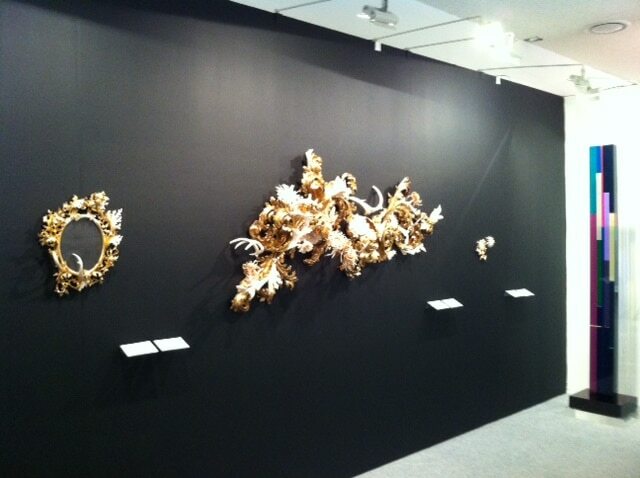 “Folly” was exhibited at the Museum of Arts and Design in New York as part of the “Flora and Fauna: MAD About Nature” exhibition in the fall of 2011. The booth will feature the work of Michael Coffey, the most important living American Studio furniture maker, and Joseph Walsh, one of the finest young talents in the world of studio furniture today. Coffey’s monumental cabinet “Galaxy II” (2010) is a tour de force of design and carving. This huge hand-carved 2.5 meters W x 2.5 meters H cabinet in American Black Walnut features six 10 cm. 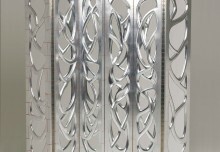 thick sculpted doors inspired by the natural wear of river rocks. The dimensional aspect of the cabinet is striking especially in the deeply carved and curved corners. This is the largest piece that Coffey has created in his eight-decade career. Walsh’s “Erosion III Dining Table” (2011) looks to emphasize the patterns of erosion and the energy of material removal that is recorded in the remaining form. The table is constructed from olive and burl ash with the lighter and darker woods creating an interplay of patterns. Baroque splendor reigns in Jennifer Trask’s unique wall pieces, a combination of her fascination with organic materials such as bone and her fondness for antique found objects. Made of 18th & 19th century Italian gilt wood fragments, bones, and 22K & 23.5 K gold, “Burgeon” (2012) evokes an experience of awe that one feels when seeing a beautiful, yet unkempt, garden where plant forms are in different stages of the cycle of growth and decay. In the center of “Burgeon” is the orange mum, the largest flower; it is made of roughly 400 pieces of various bones. Trask’s work was recently exhibited at the Sungkok Museum in Seoul, as part of the show “Open Mind” curated by Kiwon Wang. Merrill will also be exhibiting a rare and stellar “Wall Hung Sculpture Front Console” (1967) by Paul Evans. These sculpture front consoles were designed and built out of welded steel in the original New Hope, PA workshop specifically as custom commissions. 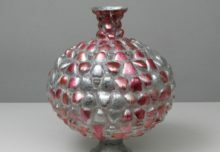 They are considered to be the most successful and most highly sought after pieces from the Evans studio. The sculptural elements are covered in red, purple, green, yellow, and blue polychrome with gold leaf and black patinated accents. The case is covered in a patchwork of deep brown and black painted and oxidized patchwork metal. Evans’ work is in the collection of the Museum of Arts and Design, New York, where it was featured in the exhibition “Crafting Modernism: Midcentury American Art and Design” at the Museum of Arts and Design in New York and also the James Michener Art Museum where a retrospective exhibition of his career will open in the fall of 2013. Included in the booth will also be “Vermillion Tantra”, a monumental tapestry designed by Jan Yoors from the 1976. Yoors was the leading figure in tapestry design in the 20th century. He captured the modern spirit of the 1960’s and 70’s in his tapestry designs in the same way that the Abstract Expressionists were able to express it through their paintings. “Vermillion Tantra” was reproduced in the spring 2012 issue of RWA Magazine. 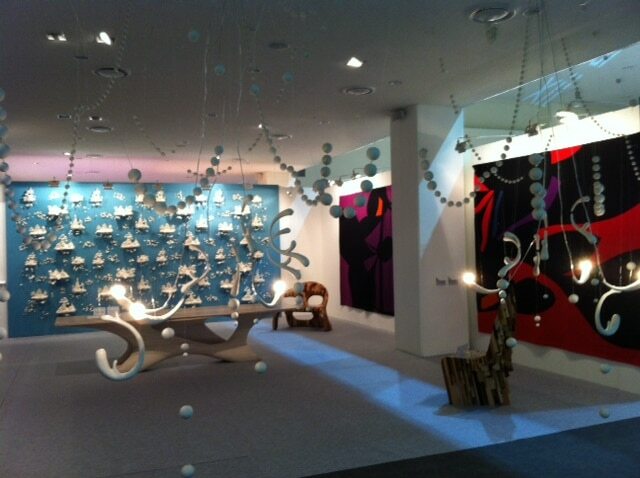 Yoors’ work was recently featured in “Crafting Modernism: Midcentury American Art and Design” at the Museum of Arts and Design in New York and will be the subject of a major retrospective at the FelixArt Museum in Brussels, Belgium in November 2012. Todd Merrill Antiques / 20th Century and Studio Contemporary (www.merrillantiques.com and www.studiocontemporary.com) is known for showing the best of twentieth century and contemporary design. The gallery is located at 65 Bleecker Street, in New York City’s only building by the father of American Modernism, esteemed architect Louis Sullivan. Merrill, a third generation dealer, opened his business in 2000 and quickly became known for a selection of the best of post-war American studio and custom furniture, as well as outstanding European 20th-century furniture and lighting. In November 2008, Rizzoli published Merrill’s book, Modern Americana: Studio Furniture from High Craft to High Glam, the first definitive book on late 20th Century American studio furniture. A year later, in 2009, Merrill launched Studio Contemporary to represent studio artists producing the best contemporary furniture and decorative arts.